The story of the phenomenally successful Cabbage Patch Kid dolls is colorful and complex, and is really a story of two amazingly skilled and talented doll makers. In the early 1970’s a creative lady by the name of Martha Nelson (later Martha Nelson Thomas) began creating soft sculpture dolls. Soft sculpture dolls are a type of rag doll that has been “sculpted” to give its face – and sometimes other body parts – a more realistic, three-dimensional look. Martha’s dolls, which she called “Doll Babies,” were made entirely from a stretch fabric and stuffed with a soft filling. They had hand painted eyes and their hair (when they had it) was usually made from yarn. Each Doll Baby was a little bit different, but their basic look was the same. 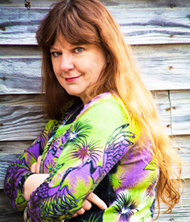 They became popular and she began selling her dolls at craft fairs. In 1976, a young art student by the name of Xavier Roberts met Martha at a craft fair and was very taken by her hand-crafted dolls. Working at the time as the manager of a gift shop in a Georgia State Park, Xavier Roberts arranged to sell some of her dolls in the shop. After several dolls were sold, Martha decided to discontinue supplying her hand-made dolls to the shop due to a dispute over pricing. She felt he was charging too much for them. To solve the supply problem of the popular dolls Xavier, a skilled artist in his own right, began making soft sculpted dolls himself, calling them “Little People”. From the beginning, Xavier Roberts hand-signed all his creations on their rear end and offered them up for “adoption.” Like Martha Nelson Thomas’s Doll Babies, the Little People dolls did very well at arts and crafts festivals. In 1978 Xavier Roberts, together with a handful of friends formed the Original Appalachian Artworks, Inc. company. Next, they renovated an old building in Cleveland, Georgia and turned it into a shop and “birth place” for his dolls. Local seamstresses were hired and trained to create and customize the dolls, and despite its unusual concept – or maybe because of it – Babyland General Hospital became an almost overnight success, gaining attention from news publications and taking on more employees as demand grew. 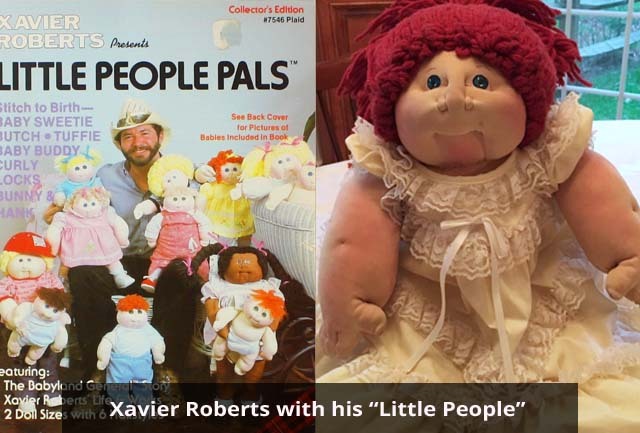 In 1979 Martha Nelson Thomas sued Xavier Roberts for copyright infringement due to the similarity of the dolls, and also for claiming in his marketing materials that his product was original, a statement with which she disagreed. Martha claimed that her million-dollar lawsuit was never about getting a piece of the growing Cabbage Patch fortune. Instead, she maintained that it was against her principals for children to be “brain-washed” by television ads into buying mass-produced toys. Her dolls were all one-of-a-kind creations and she didn’t like the fact that similar-looking dolls to her unique art dolls were now being mass-produced. 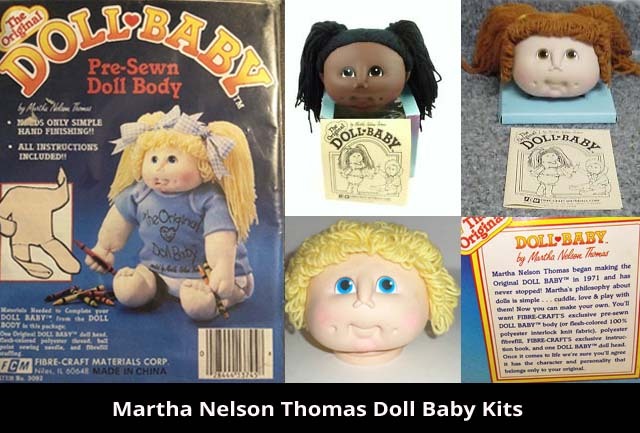 The problem was that Martha Nelson Thomas had never applied for a copyright on her Doll Baby design, whereas Xavier Roberts did on his Little People dolls. Though the hand-crafted dolls did look quite similar, the judge determined that there were sufficient differences to dismiss that part of the case and ruled in Mr. Roberts’ favor on the copyright issue. The next part of the lawsuit – the claim of originality in his advertising – had yet to be decided. With his dolls rapidly gaining popularity, Xavier Roberts chose to settle the case out of court for an undisclosed sum of money, which resolved the problem “very satisfactorily” according to a statement made at the time by Martha Nelson Thomas. She was happy with the outcome and agreed to never speak of it again. Xavier Roberts was fast becoming a savvy young entrepreneur, a rare quality in someone who was primarily a doll artist. In 1982 at the age of just 26, he granted a license to a company called Coleco to mass-produce a re-designed line of his dolls he named Cabbage Patch Kids. Their bodies were about 17″ tall and they had vinyl heads in a variety of styles. Coleco began distributing them to toy stores nationwide. Roberts retained the rights to produce limited editions of his dolls at BabyLand General Hospital. The Cabbage Patch Kids were an immediate and unprecedented success, selling millions of dolls in a matter of weeks and creating long production backlogs as demand far exceeded supply. This in turn caused a desperate dash to toy stores by parents determined to have a doll for their child for Christmas. 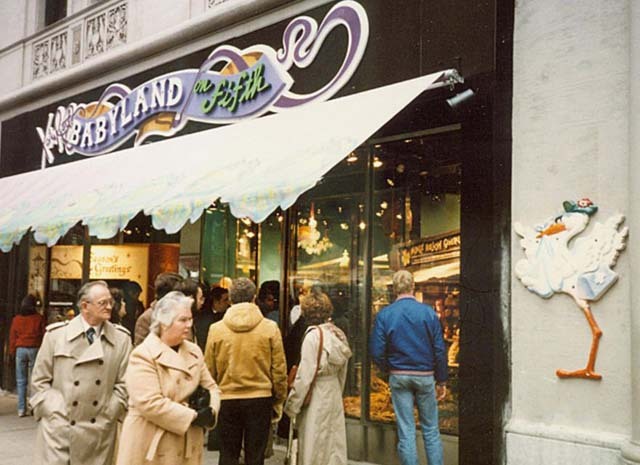 Parents lined up for hours outside stores for the chance to buy a Cabbage Patch doll, and once inside, tempers frayed. This resulted in pushing, shoving and some all-out brawls with injuries as frantic parents physically wrestled each other for the dolls. 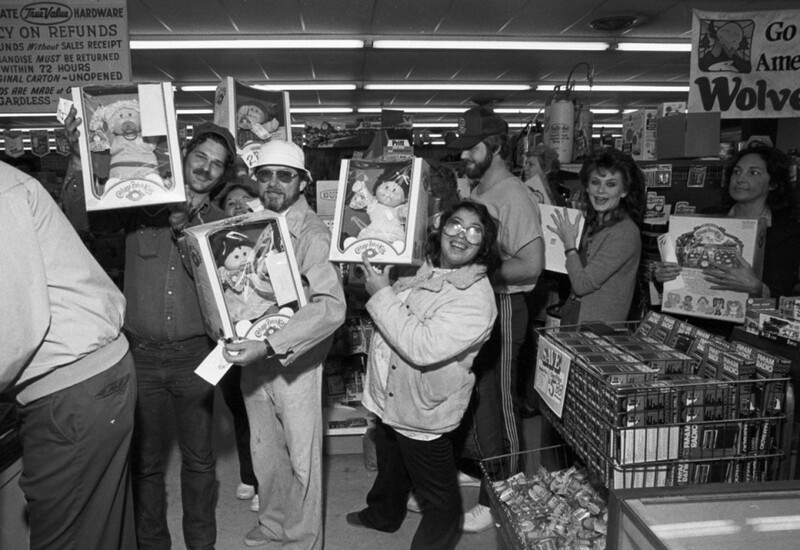 In 1984, with the extraordinary popularity of the Cabbage Patch Kids in full swing, Ms. Thomas – in partnership with a company called Fibre-Craft – released a line of “make-it-yourself” Doll Baby kits. The Doll Baby kits consisted of vinyl heads and pre-stitched bodies which were sold separately. Mothers who couldn’t afford the high prices of the store-bought Cabbage Patch Kids could make a doll for their child at a greatly reduced cost. 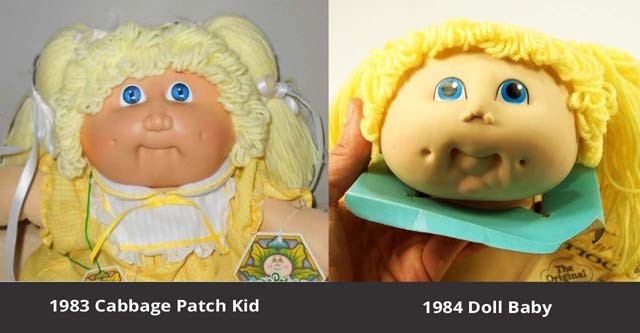 Notice that the Doll Baby packaging bears a clear claim of originality, despite the fact that the Doll Baby kits were launched a year after Cabbage Patch Kids were first in stores. If you look at the pictures below you may see that the faces of the vinyl Doll Baby heads launched in 1984 bore a somewhat eerie resemblance to the Cabbage Patch Kid faces released in 1983. The Martha Nelson Thomas Doll Body heads and the pre-stitched bodies were, ironically, mass-manufactured in Hong Kong and China. Xavier Roberts never sued Ms. Thomas for copyright infringement. Perhaps he could see the differences. More likely he was too busy designing new faces and outfits for his dolls to worry about it. While moderately successful in their own right, the Doll Baby kits never gained the immense popularity that the ready-made Cabbage Patch Kid dolls still enjoy to this day. 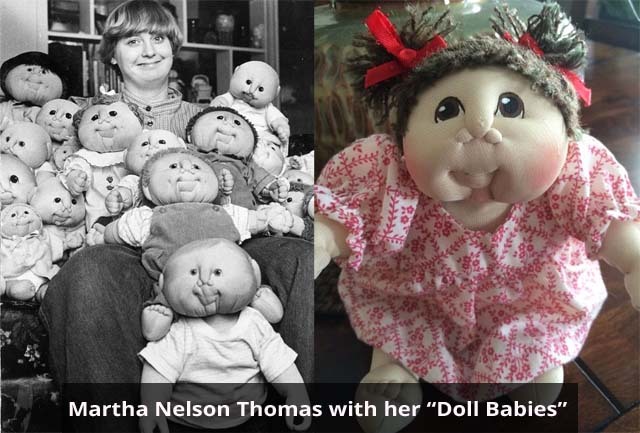 Ms. Thomas continued to create hand-made Doll Babies until she passed in 2013, surrounded by family and her favorite original Doll Baby creations. Since 1982 more than 130 million Cabbage Patch dolls have been “born,” averaging one Cabbage Patch “birth” every 6.8 seconds. Babyland General continues to be a highly-rated destination for enthusiasts to go and “adopt” limited edition Cabbage Patch Kid dolls. Original hand-signed Little People dolls can sell for up to $15,000 to avid collectors. So Who Really Invented the Cabbage Patch Dolls? The controversy over who invented the Cabbage Patch Kid dolls has been raging for almost 40 years. Many vicious things have been said about Xavier Robert. Poorly researched and downright slanderous tabloid-style articles can be found in a number of places on the Internet. Based largely on these sensationalized “news” articles, the consensus tends to have been that poor Martha Nelson Thomas was cheated out of the Cabbage Patch fortune by the wicked Xavier Roberts. But my research has turned up a slightly different picture. One that I think is fair, and that Martha Nelson would probably have agreed with herself. I’m not a person to back down from the truth, even at the risk of attracting negative remarks directed at myself. When I started the research for this article I was simply curious. Knowing what I know now, I want to set the record straight and put this story to bed once and for all. Ms. Thomas was against the idea of mass-produced toys. She felt her dolls should be individualized for each child. For that reason, Ms. Thomas never signed her dolls. Instead she tied a tag to their wrists with identifying information on them. Ms. Thomas never copyrighted her dolls’ design. Xavier Roberts met Ms. Thomas at a craft fair and fell in love with her dolls. He asked if he could sell them in the gift shop he managed, and she agreed. After several sales, Ms. Thomas withdrew her dolls from the shop because she felt he was charging too much for them. Mr. Roberts decided to pursue making his own soft-sculpture dolls which bore a marked resemblance to the Doll Babies. He called his dolls “Little People”. Mr. Roberts began to mass-produce a re-invented version of his dolls, now called “Cabbage Patch Kids.” This offended Ms. Thomas and she decided to sue him for a million dollars. A year after the initial launch of the hugely successful vinyl-headed Cabbage Patch Kids, Ms. Thomas released a Doll Baby Kit which consisted of a vinyl-headed doll and a pre-stitched body, both mass-manufactured in Asia (Hong Kong and China). It’s no secret that toys take a substantial cash investment to manufacture and market widely. It would seem that Ms. Thomas was inspired by Mr. Roberts to become a business woman in her own right. That was rare and gutsy for a woman in those days. It’s also possible that she invested some of her court case settlement to launch her own Doll Baby line. Nothing wrong with that at all. She’d worked hard and earned that right. Does any of this make Xavier Roberts a thief, a con artist or a liar? I don’t think so. Instead of continuing to fight the court case (he certainly had the money to do so) he chose to pay Martha Nelson Thomas a substantial sum of money for her efforts. Something less than a million dollars most likely, but “very satisfactory” according to Ms. Thomas herself. In reality, couldn’t it be said that Xavier Roberts gave Martha Nelson Thomas an opportunity that almost no other doll artist has ever had: the funds to launch her own doll kit to a very wide and hungry audience? There is no evidence to this day that Martha Nelson Thomas was anything but happy with the outcome. Even in her obituary it seemed that she was proud to have been the inspiration for dolls that were so loved by children around the world. So Who Are The Cabbage Patch Kids’ Real Birth Parents? Perhaps I’m a bit sentimental (I am) but I like to think they both are. It’s not uncommon for (human) children to be born as the result of a chance meeting between their parents. Thereafter, it’s an almost 50% likelihood that their birth parents, due to “irreconcilable differences” will go their separate ways. I look at Martha Nelson Thomas and Xavier Roberts as the mother and father of the most beloved cuddly and funny-faced dolls in the history of mankind. 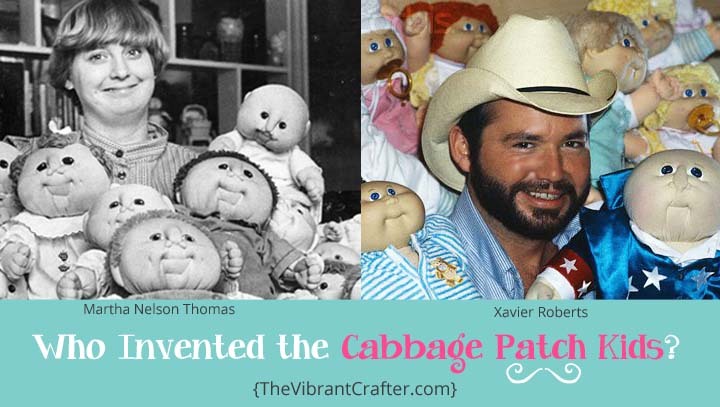 If not for Martha Nelson Thomas’ amazing talent and Xavier Roberts’ extraordinary business skills, the phenomenally successful Cabbage Patch Kids may never have been invented – or “born” – at all. And to children and collectors everywhere, that just doesn’t even bear thinking about. If you love to collect the older Cabbage Patch dolls like I do, I’ve created a tutorial on how to wash a Cabbage Patch doll just for you. Enjoy! I am a doll maker myself so my opinion is I agree with what you said. I think they both had a hand in creating the CPK. When I make a doll sometimes I will use a pattern and sometimes I will make my own and I am always inspired by something whenever I create. I think every artist is like that, but in the end, no matter if I use a pattern or not, once I make my doll it’s my creation. Even though the pattern maker helped, they did not make my doll nor could they because handmade dolls are very hard to duplicate. None of my dolls look very much like anyone else’s. However, whenever I do use a pattern I always tell people that I used a pattern and that the pattern was not my own. He should have told people where he got his idea from. Martha Nelsons original softies to me don’t look like Xavier’s. However, my heart does go out to her family and I do think she deserved the money she got. I think she is the one who gave birth to the idea and is the original creator, but Xavier had what it took to take it a step further and actually invent the Cabbage Patch doll, and make it famous. He put a story with it and gave them adoption papers and created his own dolls with hers as his inspiration. It’s a tricky subject to get into. I think CPK’s were meant to be popular. They’re very healing dolls, unlike any other doll besides the reborn ones. They have a magic to them. I believe everything happens for a reason and these dolls have their purpose.